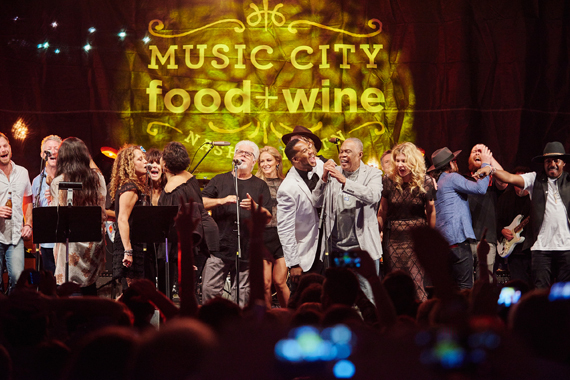 Food + Wine finale with Michael McDonald, Sam Moore, Jewel, Kings of Leon and many more. 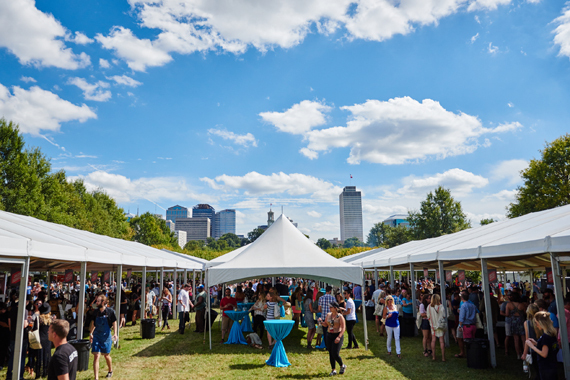 In its third year, the Music City Food + Wine Festival has grown to sizable proportions. Hosted by Kings of Leon, Vector Management’s Ken Levitan and Andy Mendelsohn, chef Jonathan Waxman, and C3 Presents, of which Live Nation recently acquired a controlling stake. Evening music churned out a few songs from each performer in the theme of soul and R&B songs. Although attendees ran through every wine bottle on the Walk of Fame Park premises before the music started, additional spirit offerings included Patron tequila, Titos vodka, Hendrick’s Gin, and Wild Turkey whiskey. Backing band, The Long Players, cranked out tunes for Kings of Leon with Ruby Amanfu (“Private Number”) before the songstress stepped out with “It’s Your Thing.” A cloud blew through for only about five minutes, leaving behind some sprinkles to which America’s Got Talent finalist Emily West joked her performance of “I Can’t Stand The Rain,” was a most appropriate selection. Additional performers included Tom Morello, Robert Randolph (“Land of 1000 Dances”), Jamie N Commons (“How Can You Mend A Broken Heart”), Hamilton Leithauser (“Walking The Dog”), Anthony Hamilton (“When A Man Loves A Woman”), Jewel (“I Can’t Get Next To You”), Jesse Baylon (“Let’s Stay Together”), Madisen Ward & The Mama Bear (“Sittin’ On The Dock Of The Bay,” “You’ve Really Got A Hold On Me”), Andy Hull (“Georgia On My Mind”), Parker Gispert spontaneously joined by chef Carla Hall (“Hold On I’m Comin’”), Michelle Branch (“I Just Want To Make Love To You”), and Michael McDonald joined by Sam Moore for (“Mr. Pitiful,” “When Something Is Wrong With My Baby”). The whole cast joined for “Soul Man” to close the night by 11 p.m.
Moving this year to the Bicentennial Park lawn, the daytime events consisted mostly of local vendors providing noshes alongside alcohol offerings. Vintners, distilleries, distributors and breweries filled glasses from 11 a.m. – 4 p.m. Sizable crowds were had on Saturday, enjoying DJ Mel who pumped tunes from a center podium. For the first time in the festival’s three year run, the afternoon session turned into a daytime dance party albeit cut short by the time restraint. 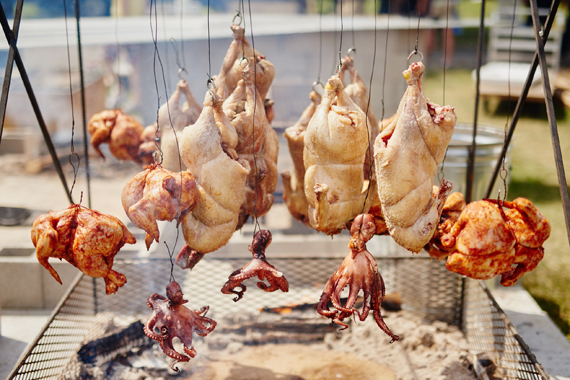 Saturday and Sunday’s Grand Taste at Nashville’s Bicentennial Lawn. Event sponsor Infiniti and Uber offered complementary rides from the festival’s three events in 2015-model SUVs. 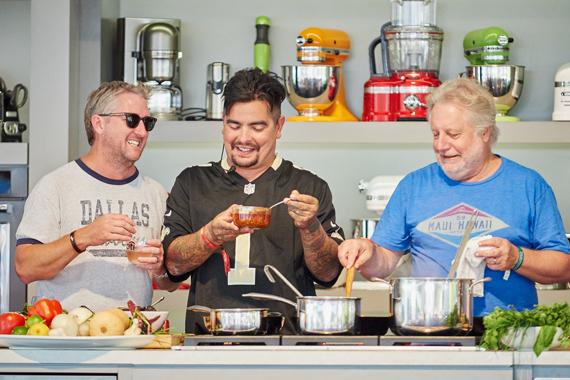 Chefs Tim Love (R), Aaron Sanchez (C) and Jonathan Waxman (L). Andrew Zimmern’s BBQ near Martin’s BBQ daytime setup.